MapYourTech.com Share and Explore the Tech Inside You!!! The Bit Error Rate (BER) of a digital optical receiver indicates the probability of an incorrect bit identification. In other words, the BER is the ratio of bits received in error to the total number of bits received. Below lists different values for BER and their corresponding errors per bits and over time. As we know that, the photocurrent is converted to a voltage then measured. The measurement procedure involves a decision as to whether the bit received is a 1 or a 0. The BER is a not only a function of the noise in the receiver and distortion in the system, but also on the decision level voltage,VD that is the threshold level above which the signal is classified as a 1 and below which the signal is classified as a 0. Even an ideal signal with no noise nor distortions has a non-zero BER if the decision level is set too high or too low. For example, if VD is set above the voltage of the 1 bit, the BER is 0.5, assuming equal probability of receiving a one and a zero. where p(1) and p(0) are the probabilities of receiving a 1 and a 0, respectively. P(0/1) is the probability of deciding a 0 when the bit is actually a 1, and P(1/0) is the probability of deciding a 1 when the bit is a 0. (a) Energy level scheme of ground and first two excited states of Er ions in a silica matrix. The sublevel splitting and the lengths of arrows representing absorption and emission transitions are not drawn to scale. In the case of the 4 I11/2 state, s is the lifetime for nonradiative decay to the I13/2 first excited state and ssp is the spontaneous lifetime of the 4 I13/2 first excited state. (b) Absorption coefficient, a, and emission coefficient, g*, spectra for a typical aluminum co-doped EDF. .The most important feature of the level scheme is that the transition energy between the I15/2 ground state and the I13/2 first excited state corresponds to photon wavelengths (approximately 1530 to 1560 nm) for which the attenuation in silica fibers is lowest. Amplification is achieved by creating an inversion by pumping atoms into the first excited state, typically using either 980 nm or 1480 nm diode lasers. Because of the superior noise figure they provide and their superior wall plug efficiency, most EDFAs are built using 980 nm pump diodes. 1480 nm pump diodes are still often used in L-band EDFAs although here, too, 980 nm pumps are becoming more widely used. Though pumping with 1480 nm is used and has an optical power conversion efficiency which is higher than that for 980 nm pumping, the latter is preferred because of the following advantages it has over 1480 nm pumping. It provides a wider separation between the laser wavelength and pump wavelength. 980 nm pumping gives less noise than 1480nm. Unlike 1480 nm pumping, 980 nm pumping cannot stimulate back transition to the ground state. The reason for better performance of 980 nm pumping over the 1.48 m pumping is related to the fact that the former has a narrower absorption spectrum. The inversion factor almost becomes 1 in case of 980 nm pumping whereas for 1480 nm pumping the best one gets is about 1.6. Quantum mechanics puts a lower limit of 3 dB to the optical noise figure at high optical gain. 980 nm pimping provides a value of 3.1 dB, close to the quantum limit whereas 1.48 pumping gives a value of 4.2 dB. 1480nm pump needs more electrical power compare to 980nm. The 980 nm pumps EDFA’s are widely used in terrestrial systems while 1480nm pumps are used as Remote Optically Pumped Amplifiers (ROPA) in subsea links where it is difficult to put amplifiers.For submarine systems, remote pumping can be used in order not to have to electrically feed the amplifiers and remove electronic parts.Nowadays ,this is used in pumping up to 200km. The erbium-doped fiber can be activated by a pump wavelength of 980 or 1480 nm but only the second one is used in repeaterless systems due to the lower fiber loss at 1.48 mm with respect to the loss at 0.98 mm. This allows the distance between the terminal and the remote amplifier to be increased. Due to the inhomogeneous portion of the linewidth broadening of the dopant ions, the gain spectrum has an inhomogeneous component and gain saturation occurs, to a small extent, in an inhomogeneous manner. This effect is known as spectral hole burning because a high power signal at one wavelength can 'burn' a hole in the gain for wavelengths close to that signal by saturation of the inhomogeneously broadened ions. 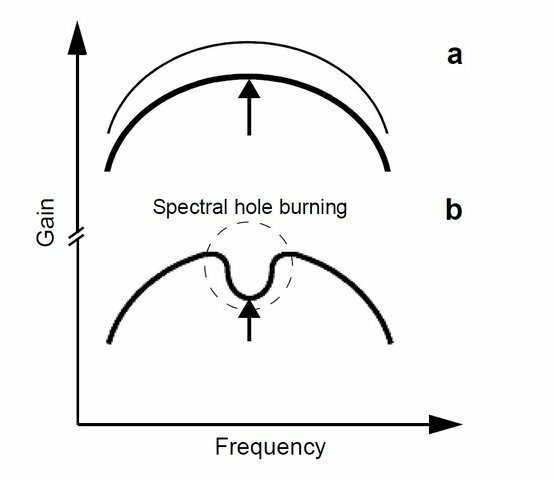 Spectral holes vary in width depending on the characteristics of the optical fiber in question and the power of the burning signal, but are typically less than 1 nm at the short wavelength end of the C-band, and a few nm at the long wavelength end of the C-band. The depth of the holes are very small, though, making it difficult to observe in practice. In addition, accurate predictions are very difficult to carry out. SHB acts as a selective oversaturation of specific erbium ion classes due to a precise matching of the signal wavelength with their corresponding Stark energy sublevels. Gain contributions of a given ion class to the overall amplifier gain spectrum will be dependent on the specific values of energy of the related Stark sublevel (determined by inhomogeneities in the local electric field in the glass as opposed to on the crystal) and of their population density (i.e. of the related induced saturation). Clearly, the overall gain spectrum of the amplifier may be distorted due to this SHB effect. The best-known induced distortion is the hole induced in the gain spectrum in the spectral vicinity of a saturated channel. The SHB effect not only stresses the dynamic range of the system by increasing the burst power but it also degrades the OSNR performance. In particular, whilst the power change is limited to the beginning of the burst (during the formation of the hole), the OSNR impairment is observed at the end of burst,where the spectral holeis already completely formed by the burst. SHB also has a limiting effect in the implementation of preemphasis of the less-favored channels. This technique consists of increasing the power of the worst channels at the transmitter side, at the expense of the best channels, leading to the same OSNR for all channels at the link output. This can be performed while keeping the EDFA output powers constant and decreasing the transmitted power of the best channels. However, the highest predistortion that can be performed at the link input in order to compensate for a given excursion in output OSNR is limited by SHB. •Reliability of land-based equipment is somewhat relaxed, corresponding to a 15-year required lifetime. • Submarine systems are designed for a 25-year lifetime and a minimum of ship repair that imply reliability and redundancy of all the critical components. • Terrestrial equipment should enable operation over a wide temperature range of −5, +70°C (and −40, +85°C in storage conditions). This wide temperature range makes it necessary to implement cooling means for the highest temperatures and compensation means for temperature-sensitive devices. • In submarine amplifiers, heat is dissipated from the outer side of the repeater container into the sea. Such a container is designed in order to make the heat go through the box from the pump device to the outer side, ensuring moderate temperature in all points. Temperature of the deep sea is indeed around +5°C. Specific care is taken for repeaters located at the coast or in shallow water, in order to guarantee no pump failure while avoiding Peltier cooling. For reliability reasons, no glue is used on the optical path. The constant temperature of the devices and the doped fiber incorporated in the amplifier makes it possible to perfectly tailor the gain spectrum of the submerged EDFAs, owing to very accurate equalizing filters and to concatenating hundreds of amplifiers. This would not be possible for land-based amplifiers whose gain cannot be guaranteed below 1 dB for a 30-nm bandwidth partly due to such temperature changes (while a few tenths of dB of gain excursion is reached for submarine amplifiers). • The infrastructure itself of terrestrial systems determines the actual characteristics of the amplifier that needs to cope with important variations of the span loss between two amplifier sites. In addition, for economical reasons, the amplifiers cannot be tailored to cope with this nonuniform link. • In submarine systems, the link is manufactured at the same time as the amplifiers and much attention is paid to guarantee constant attenuation loss between amplifier values, while the amplifier has been designed to perfectly adapt to the link characteristics. • There are high gain range (20 to 35 dB) of the amplifiers incorporated in land-based systems and allowed by the margins given on the OSNR due to the reduced total link length. Gain equalizers therefore compensate for much larger gain excursion values than in submarine amplifiers and should therefore be located at amplifier midstage in order not to impact their equalizing loss on the amplifier output power. • On the contrary, such filters can be placed after the single section of doped fiber that composes the amplifier in the case of submarine applications. Here the results are after evaluating the effect of a thermal variation on the output tilt. In this particular set-up the amplifier is kept at room temperature (25 °C) and only the active fiber spool undergo a thermal cycle. Temperature of the EDFA is varied from 0 °C to 65 °C and the amplifier gain is measured at four point : 0, 25, 40 and 65 °C. As can be seen a 65 °C temperature variation implies a 1.8 dB tilt variation. Considering a reduced temperature range (5-45 °C) the output tilt variation is about 1.1 dB. It was tried to investigate the origin of the temperature dependency. First used a different EDFA with a lower erbium concentration (14 dB/m erbium peak absorption); then tried to reduce the saturation of the EDFA using lower power levels, but in both cases the output tilt variation was very similar to that of Figure . Temperature variation has also effect on the EDFA efficiency: with high temperature the active fiber is less efficient than at low temperature. With constant pumps power, a 65°C variation implies a 0.25 dB difference on the output power. To compensate this extra tilt we can act in two way: using the VOA ; heating the EDFA to a constant 65 °C. First solution requires a thermal sensor to measure the EDFA temperature and a compensation table (stored in the firmware) to act on VOA attenuation. Second solution requires a heater and special mechanics & software to store the EDFA spool and to keep their temperature constant. The Raman amplifier is typically much more costly and has less gain than an Erbium Doped Fiber Amplifier (EDFA) amplifier. Therefore it is used only for speciality applications. The main advantage that this amplifier has over the EDFA is that it generates very less noise and hence does not degrade span Optical to Signal Noise Ratio (OSNR) as much as the EDFA. 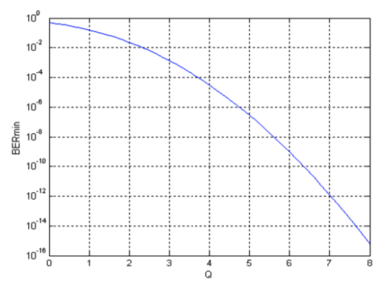 Its typical application is in EDFA spans where additional gain is required but the OSNR limit has been reached. Adding a Raman amplifier might not significantly affect OSNR, but can provide up to a 20dB signal gain. Another key attribute is the potential to amplify any fiber band, not just the C band as is the case for the EDFA. 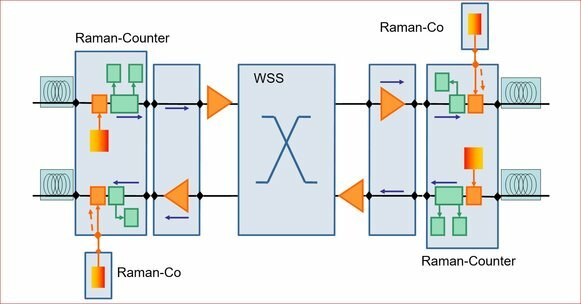 This allows for Raman amplifiers to boost signals in O, E, and S bands (for Coarse Wavelength Division Multiplexing (CWDM) amplification application). The amplifier works on the principle of Stimulated Raman Scattering (SRS), which is a nonlinear effect. It consists of a high-power pump laser and fiber coupler (optical circulator). 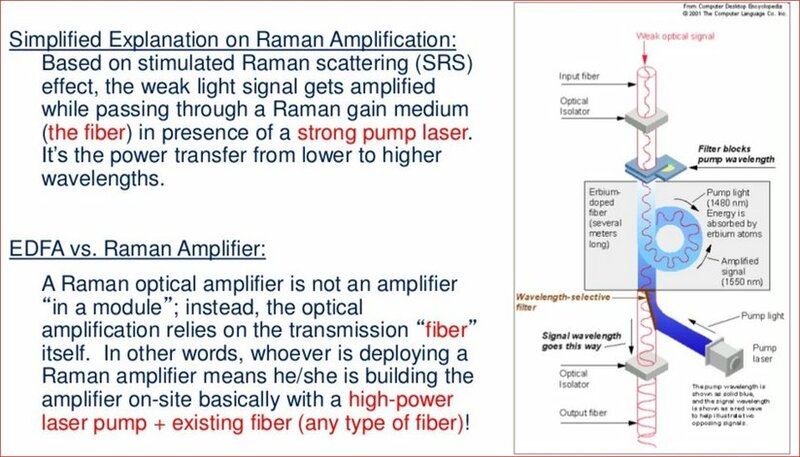 The amplification medium is the span fiber in a Distributed Type Raman Amplifier (DRA). Dstributed Feedback (DFB) laser is a narrow spectral bandwith which is used as a safety mechanism for Raman Card. DFB sends pulse to check any back reflection that exists in the length of fiber. 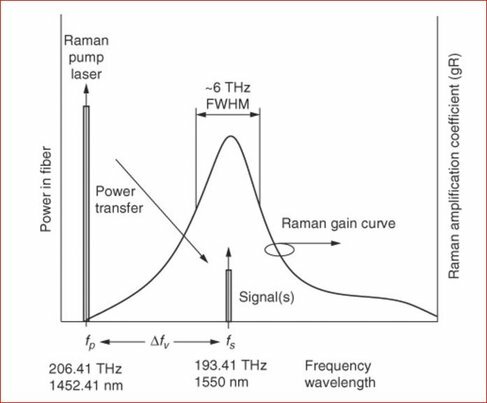 If no High Back Reflection (HBR) is found, Raman starts to transmit. Generally HBR is checked in initial few kilometers of fibers to first 20 Km. If HBR is detected, Raman will not work. Some fiber activity is needed after you find the problem area via OTDR. The lumped or discrete type Raman amplifier internally contains a sufficiently long spool of fiber where the signal amplification occurs. The DRA pump laser is connected to the fiber span in either a counter pump (reverse pump) or a co-pump (forward pump) or configuration. The advantage of the co-pump configurations is that it produces less noise. As the pump laser photons propagate in the fiber, they collide and are absorbed by fiber molecules or atoms. This excites the molecules or atoms to higher energy levels. The higher energy levels are not stable states so they quickly decay to lower intermediate energy levels releasing energy as photons in any direction at lower frequencies. This is known as spontaneous Raman scattering or Stokes scattering and contributes to noise in the fiber. Since the molecules decay to an intermediate energy vibration level, the change in energy is less than the initial received energy during molecule excitation. This change in energy from excited level to intermediate level determines the photon frequency since Δ f = Δ E / h . This is referred to as the Stokes frequency shift and determines the Raman gain versus frequency curve shape and location. The remaining energy from the intermediate level to ground level is dissipated as molecular vibrations (phonons) in the fiber. Since there exists a wide range of higher energy levels, the gain curve has a broad spectral width of approximately 30 THz. During stimulated Raman scattering, signal photons co-propagate frequency gain curve spectrum, and acquire energy from the Stokes wave, resulting in signal amplification. The Raman gain curve’s FWHM width is about 6 THz (48 nm) with a peak at about 13.2 THz below the pump frequency. This is the useful signal amplification spectrum. 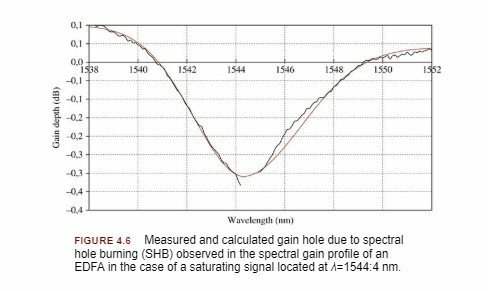 Therefore, to amplify a signal in the 1550 nm range the pump laser frequency is required to be 13.2 THz below the signal frequency at about 1452 nm. Multiple pump lasers with side-by-side gain curves are used to widen the total Raman gain curve. 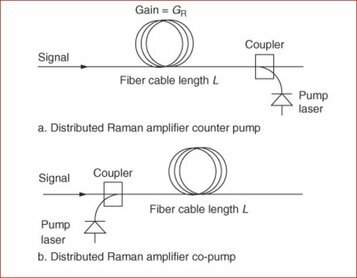 Raman gain is the net signal gain distributed over the fiber’s effective length.It is a function of pump laser power, fiber effective length, and fiber area. For fibers with a small effective area, such as in dispersion compensation fiber, Raman gain is higher. Gain is also dependent on the signal separation from the laser pump wavelength,Raman signal gain is also specified and field measured as on/off gain. This is defined as the ratio of the output signal power with the pump laser on and off.In most cases the Raman ASE noise has little effect on the measured signal value with the pump laser on. However, if there is considerable noise, which can be experienced when the measurement spectral width is large, then the noise power measured with the signal off is subtracted from the pump on signal power to obtain an accurate on/off gain value.The Raman on/off gain is often referred to as the Raman gain. 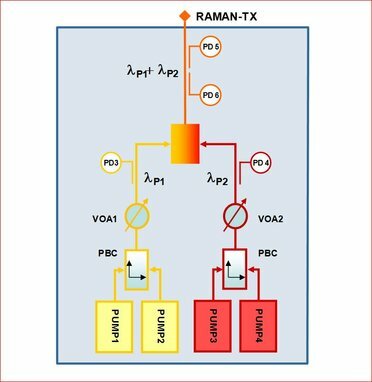 In addition, to obtain significant gain, pump power used in distributed Raman amplification is much higher than signal power. Therefore, the pump energy transferred in the process of stimulated emission remains low compared to the involved pump power level in the case of practical distributed Raman amplification. This makes the Raman gain weakly dependent on the total signal power, or on the channel count. This is an advantage in terms of practical implementation, but also requires a perfect control of the pump power. Backward pumping is therefore usually used to average the effects of pump instabilities and its relative intensity noise (RIN). It is worth pointing out that Raman gain (expressed in dB) that is produced is a linear function of the pump power. This is because there is almost no gain saturation induced by signal power in distributed preamplification, making the amplification process operate as in the small-signal input power regime. This is quite different compared to EDFAs, which are operated in saturation for having high output power. Their output power is then a linear function of the pump power, making their gain, expressed in dB, a logarithmic function of the pump power. ASE noise is due to photon generation by spontaneous Raman scattering. DRS noise occurs when twice reflected signal power due to Rayleigh scattering is amplified and interferes with the original signal as crosstalk noise. The strongest reflections occur from connectors and bad splices. 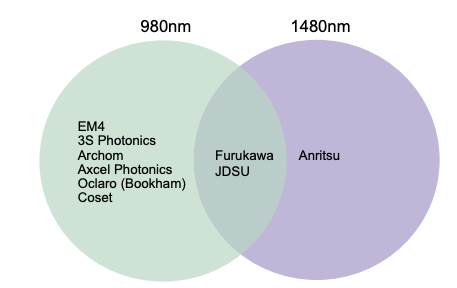 Typically DRS noise is less than ASE noise, but for multiple Raman spans it can add up. To reduce this interference, ultra polish connectors (UPC) or angle polish (APC) connectors can be used. Optical isolators can be installed after the laser diodes to reduce reflections into the laser. Also span OTDR traces can help locate high-reflective events for repair. 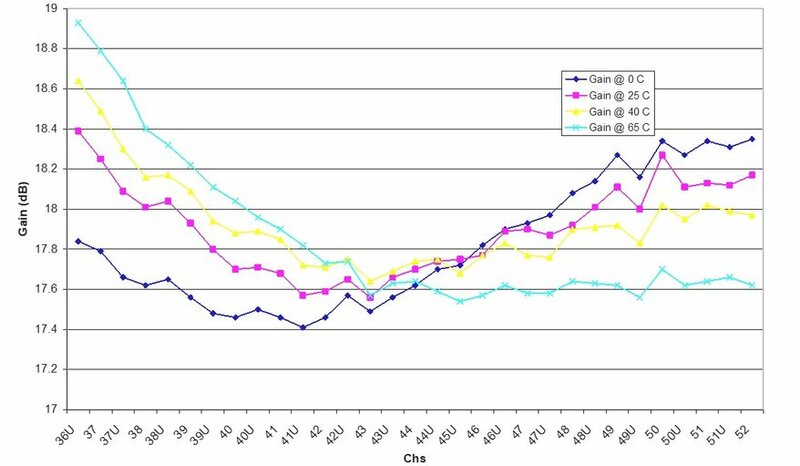 Counter pump DRA configuration results in better OSNR performance for signal gains of 15 dB and greater. Pump laser noise is less of a concern because it usually is quite low with RIN of better than 160 dB/Hz. Nonlinear Kerr effects can also contribute to noise due to the high laser pump power. For fibers with low DRS noise, the Raman noise figure due to ASE is much better than the EDFA noise figure. Typically the Raman noise figure is –2 to 0 dB, which is about 6 dB better than the EDFA noise figure. Raman amplifier noise factor is defined as the OSNR at the input of the amplifier to the OSNR at the output of the amplifier. The DRA noise and signal gain is distributed over the span fiber’s effective length. 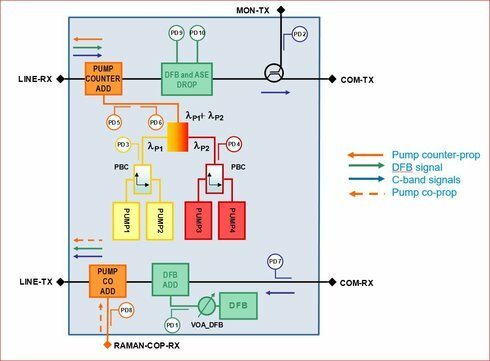 Counter pump distributed Raman amplifiers are often combined with EDFA pre-amps to extend span distances. This hybrid configuration can provide 6 dB improvement in the OSNR, which can significantly extend span lengths or increase span loss budget. 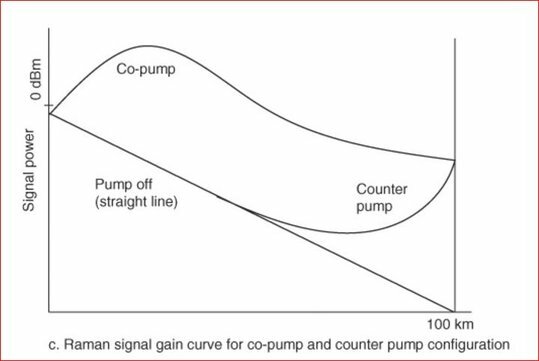 Counter pump DRA can also help reduce nonlinear effects by allowing for channel launch power reduction. In the practical Network we have 12 spans and each having atleast one EDFA ,please guide how to correlate this scenario with this article of max 4 to 6 EDFA in a fiber chain.